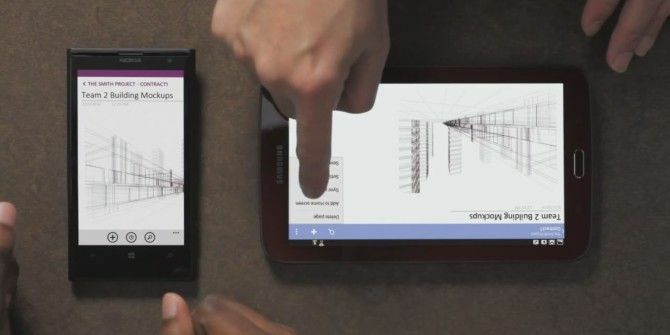 Microsoft’s OneNote is the best note-taking app for Windows 8 The Perfect Modern Notetaking App: OneNote For Windows 8 The Perfect Modern Notetaking App: OneNote For Windows 8 Microsoft finally did something right! OneNote turns your Windows 8 tablet into a handy notebook. Quickly scribble down notes and pick them up anywhere. Syncing via SkyDrive automatically makes them available on the desktop. Read More and there’s some good news. It’s now completely free and Microsoft has also come out with a version for Mac, which means OneNote is now a cross-platform app available on Web, Windows, Mac, iOS, Android and Windows Phone. OneNote 2013 is completely free for users to download and install, but there is a premium version for Office 365 and Office 2013 users with features like SharePoint support, version history, Outlook integration and more. But the core capabilities are intact in the free version, Microsoft says. Plus, everything is synced with your Microsoft Account’s OneDrive to give you 7GB of free storage with no monthly upload limit. OneNote Clipper: The new OneNote Clipper extension (Chrome, Firefox, Internet Explorer, Safari) captures any web page in one click and puts it into Quick Notes. Quick email notes: Send a link, a message or forward anything from your Outlook inbox to me@onenote.com and it’ll be auto-saved your OneNote Quick Notes. Office Lens: Office Lens is a Windows Phone app that will capture any image of text (like business cards, whiteboards) and put it into your OneNote Quick Notes. OneNote uses OCR to turn this into searchable text. If you aren’t already a OneNote user, download the free OneNote to start. And while you’re doing that, here are 10 awesome tips to maximize your OneNote 10 Awesome OneNote Tips You Should Be Using All the Time 10 Awesome OneNote Tips You Should Be Using All the Time Microsoft OneNote is just as good as Evernote. OneNote is the digital equivalent of a binder, giving you more organizational control. We show you effective note-taking tweaks you'll love. Read More . Explore more about: Microsoft OneNote, Windows 8. No outlook integration or version control for Mac? It looks like all files are saved ONLY in the Cloud unless you pay for the premium feature. No thanks. Neither of the Chrome extensions seen to work with OS X! So not really a good start!